What is a “freestart collision”? Even though freestart collisions do not directly lead to actual collisions for SHA-1, in our case, the experimental data we obtained in the process enable significantly more accurate projections on the real-world cost of actual collisions for SHA-1, compared to previous projections. What is a "freestart collision" on a hash function? For the very first block there is not previous "chaining value". Instead a particular value, called an initialisation vector (IV) is given. A freestart collision is a collision where the attacker can choose the IV. Their attack, as they claim in their work, is the first one to break the whole 80 rounds of the SHA-1 compression function. Even if a freestart collision does not immediately give a standard collision, it could be used in multiblock collision search. The chaining value indeed is the compression function output of the previous block. It is not clear (or at least not to me) how easy the path from a freestart collision to a standard collision is. As an example: It took 8 years for MD5. The first freestart collision for MD5 was found in 1996 (Dobbertin, Eurocrypt Rump Session) but the first standard collision on MD5 was published only in 2004. Finding out a freestart collision on an hash function does not break completely the function but shows a great weakness. With a freestart collision researchers exhibit the second half of two colliding messages. One could say that we now know how the path leading to the collision but we do not know, yet, where it starts. Last step left to research is find out a block message $m_0$ which $SHA$-$1(m_0)$ is equal to the freestart IV. When such message is found, the collision is served. 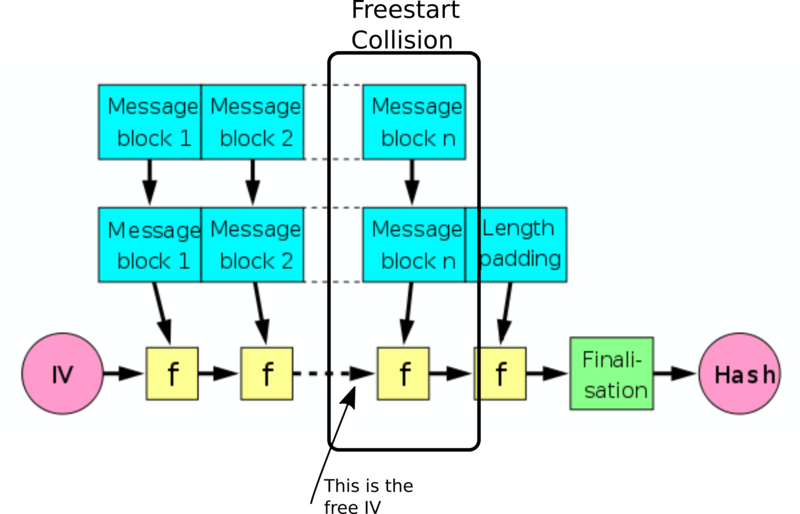 It has to been said that finding out a message that is hashed into a given value is infeasible (it is still an hard problem for the broken MD5 hash function). Not the answer you're looking for? Browse other questions tagged hash cryptanalysis collision-resistance terminology or ask your own question. What is the new attack on SHA-1 “SHAttered” and how does it work? Is MD5 second-preimage resistant when used only on FIXED length messages? How to find 64 collisions for a hash value? What is a 76-step SHA1 collision? Can the attack against SHA-1 be parallelized? Is the composition of collision resistant hash with non collision resistant hash a collision resistant hash? Is double hashing collision resistant? What are the differences between collision attack and birthday attack? What is perfect collision-resistence in probability terms? What is many:1 and collision in MD5? What is a pseudo-collision attack? Would this hash functionality fall under pre-image resistance or collision resistance?